The Corrib gas project is one of the most significant engineering projects ever undertaken in Ireland. 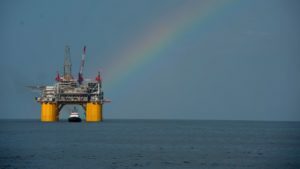 Located some 83 kilometres off the northwest coast of County Mayo, this medium sized gas field will be developed as a subsea ‘tie-back’ facility, connected by a pipeline to an onshore processing terminal. The Corrib Gas Partners are Shell E&P Ireland Limited (45% – Operator), Statoil Exploration (Ireland) Limited (36.5%) and Vermilion Energy (18.5%). The gas terminal at Bellanaboy Bridge. The offshore sub-sea infrastructure, the offshore pipeline, and the terminal at Bellanaboy are substantially completed. Construction of the onshore pipeline, which includes a tunnel under Sruwaddacon Bay is now well under way. The laying of the offshore umbilical between the landfall at Glengad and the Corrib subsea manifold was completed summer 2013. Minimising environmental impact is central to the entire project and every effort will ne made to ensure the lightest possible environmental footprint at all times. The use of best available technology and the integration of environmental protection practices into the design, construction and operation of all aspects of the project helps to meet this objective. 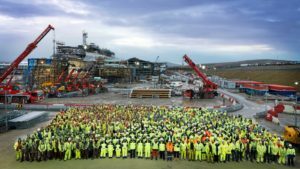 The safety and security of employees, contractors and the communities in which they operate is the number one priority for the Corrib Gas Partners. Their overall safety performance objective – Goal Zero – is to have no incidents that might put people, neighbours or facilities at risk. With safety in mind, every option for the design of the Corrib project was considered. Offshore processing was examined and deemed to be less safe, as it involved the transportation of workers to an offshore platform in difficult weather conditions. The Corrib field will be developed as a subsea production facility with onshore processing.